-Homemade dog and cat treats. no preservatives , no sugar, no salt , no artificial flavoring. Many Fall Scents Available Now!! We use Soy Wax, our products have strong scents, a long burn time, and a huge selection of fragrances. Eggplant, lettuce, mixed greens, all kinds of peppers, cucumbers, yellow squash, zucchini , the first tomatoes, and some aloe plants. ​​Wood crafted items made with a scroll saw: Military, First Responders, Inlaid patterns, Medical Personnel, Motorcycles, Cars, Outdoor scenes, Animals and much much more. Will take orders from catalogs ..ask Ken! Cakes, and possibly mini pies. Hot process soap, lotion, lip balms, candles, candle tarts, whipped Shea butter, pixie dust, bath bombs, fragrance balms, air fresheners, shampoo, conditioner, and body wash. Ask about my Free Soap Samples!!! 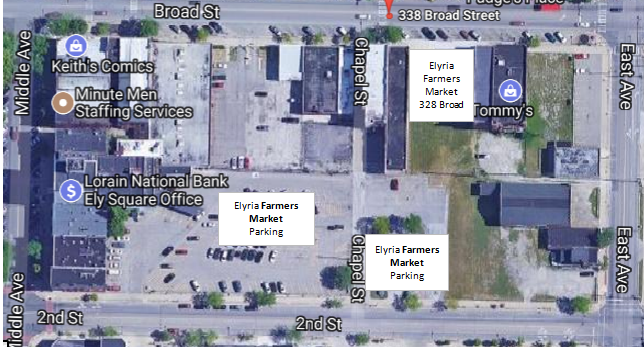 Elyria Farmers Market located in downtown Elyria in Pioneer Plaza, 328 Broad St. Ample parking off of 2nd Street. Sponsors for 2018 Elyria Farmers Market...Thank You!